I have been hunting for that perfect, easy, casual dress for a long time. Something easy to slip on when I’m headed to an event at the kids’ school but nice enough to wear when I am teaching a sewing class or out for a casual dinner date. Top priority was really that I was comfortable (of course, this is always first in my world) but a wee bit on the dressy side. I’ve been on the hunt for this kind of ‘all occasion’ dress pattern for a while, actually. I thought about adapting the Lou Box Top, like Erin from Sewbon did. She is so clever and talented, isn’t she? But, I wasn’t in love with the neckline on the Lou Box and was concerned that the drop shoulders would look too unstructured on me. Then came the record scratch! 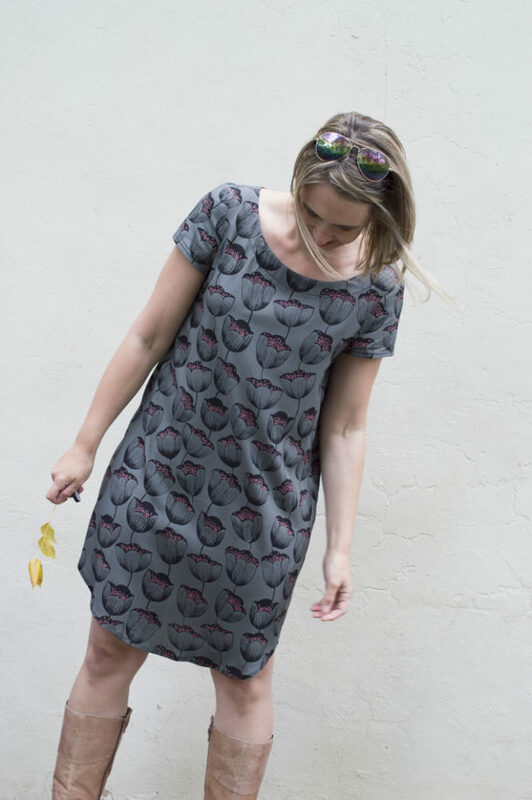 I was perusing the Seamwork magazine patterns because I have a some extra (read = a gazillion) pattern points and came across the beautiful Georgia dress. First, I made a muslin (so proud of myself!) and realized that I didn’t like the two-toned aspect especially with my fabric being such a large-scale print. I also didn’t like the length of the sleeves; they were just too long. So, I hacked the pattern to shorten the sleeves by 2 inches and mashed together the top bodice and skirt pattern pieces to create a seamless dress. It became everything I was looking for. I also graded from a 6 in the bust to an 8 at the hips because I have to accommodate my luscious hips. I have already worn this dress half a dozen times. I am in love with my hacked Georgia Dress in rayon. I bought more rayon and have plans to make a shirt from this pattern as well as a second dress. Possibly a dress with petal sleeves like these stunning ones. You are probably thinking, “Melissa, this dress is cute as a button and you look gorgeous as hell but isn’t it getting cold outside in New Jersey?! Why are you talking about flow-y drape-y, short-sleeved dresses? Make some warm things!” While I appreciate your very specific concern and thank you for your generous, unprompted compliments, I have to confess that I just can’t seem to get excited about sewing cold weather clothing. 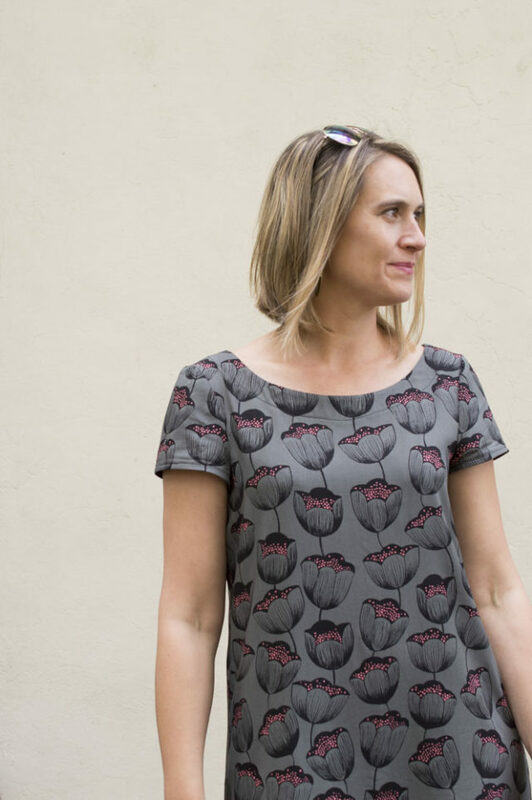 I did make my lovely Anegada top but even that has elbow-length sleeves. I just see a drastic and concurrent decrease in sew-jo when I look at cold weather patterns. My brain goes blah. I did force myself to make another pair of sloan leggings and another long-sleeve plantain tee the other day but I was mumbling like a grumpy old man the entire time. I’m just not feeling it. I would rather be folding laundry. Let’s hope this feeling passes soon or I will be sewing like a woman with the delusional belief she lives in Florida. Hahahaha I live in FL & LOVE your dress so thank you very much it works for me & is perfect for our 70* temp today. Also totally LOVE this fabric & am now convinced I HAVE to have it. yes! Enjoy the weather for me and definitely sa-shay around in a Georgia dress! I love it too, and I’m so glad I ordered this fabric last week! I hemmed and hawed because of the scale of the print, but it really works with the simple lines of your dress. Win! Thank you! It’s always a balance between simple lines and “looking like a sack” so I was thrilled this one worked out for the better! FYI: Grace at Maker Mountain has a few yards of this gorgeous fabric left! She does? This is great news, I actually checked because I wanted to link to a small, mama-owned shop and I didn’t see it in her listings. I go look now and add a link. You DO look as cute as a button, and I WAS wondering if you were cold! Haha! Of course, I’m sitting here in a sweater that used to belong to my gigantic brother…my style goes totally out the window when I’m chilly.